I’m a sculptor-drawer and i’m living in a region called Vendée (France). After 2 years in a drawing school, i decide to work as a freelance artist and to make books and comics for children. I look for a publisher for my books projects but as it is very difficult to find one, i decide at the same time to test sculpting stuff. In 2007, i come across a BJD site (Ball Jointed Doll). 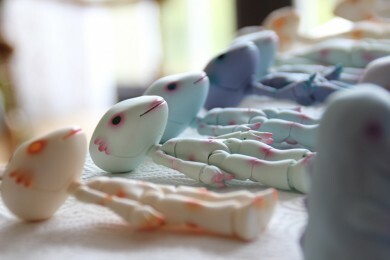 I fall in love with these strange dolls and that stimulates my creativity. I try then to create my own bjd doll even if the first attempts are not very successful. Finally, i present my first bjd called XB12 at the Ldoll festival in Lyon in 2011. Further to good feedbacks on my work, i decide to go on with dolls and monsters. I create Bactro in 2012, Feldspathe and Ambroise in 2013, Pollen in 2014, Little radish in 2016 and a mini Bactro in 2017. I love sculpting too strange and oniric creatures. I would like to spend more time on these kind of sculptures because it’s a so great way for imagination.